Golden Heavy Body Matte Acrylics provide a uniform flat finish in a wide variety of concentrated colors whild avoiding the loss of color which commonly occurs when matte medium is added to acrylic paint. 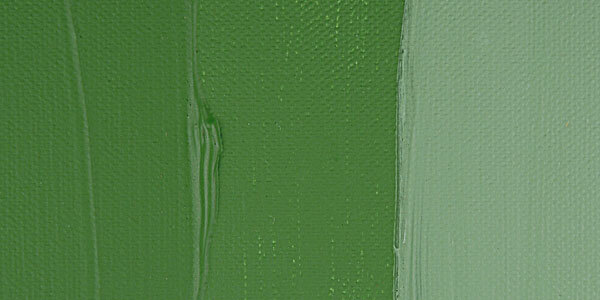 Chromium Oxide Green is a dull, dense, willow or pale green color that is completely opaque. It has an average drying time and a low tinting strength. It is fairly flexible in oil form and is suitable for all purposes and mediums. 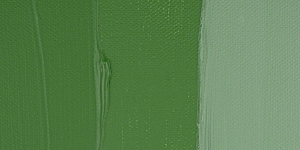 This pigment is less versatile in mixtures than Viridian and Phthalocyanine Green, but mixes well with other colors without overpowering them. Chromium Oxide Green has excellent permanence, even at high temperatures. Chromium Oxide Green is slightly toxic. Evidence of Chromium(III) carcinogenicity is inconclusive. Chromium(III) salts appear in greenish pigments such as PG17. Chromium(VI) salts, which appear in yellowish pigments, have been proven to cause cancer. Louis-Nicolas Vauquelin discovered the element chromium in lead chromate in 1797. It began to be used as an enamel and ceramic color in 1809, but it had limited use as a pigment until 1862, because of its cost. It is the most commonly used green for military camouflage because it appears the same shade as living foliage under infrared light. Chrome Oxide Green, Olive Green, Permanent Green. Varieties of Chromium Oxide Green include Arnaudon's Green, Dingler's Green, Plessy's Green, and Schnitzer's Green.